Sleek, strappy and stylish – Vienna is the perfect go-to shoe for effortless style. 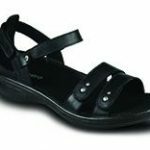 These orthopedic shoes for women feature a sleek strap design for a universally flattering fit. The straps are completely adjustable for a tailored fit. The Vienna is also an orthotic friendly shoe, with a removable insole to insert your own tailor-made orthotics.